Sirens won their right to meet San Ġiljan in the semi-final, after edging Exiles for the second time and beating them 16-14 on aggregate. Sirens started in a better fashion and took a 3-2 first session advantage. An uncoverted penalty by Slobodan Nikic and a missed open chance proved the downfall for Exiles in that opening session. Yesterday, Exiles were betrayed by their inaccuracies on the point of shooting with Nicolas Bicari who netted a nap-hand at that juncture, and a goal by John Brownrigg had extend Sirens’ lead to 7-4 despite efforts by Mark Fenech and Nikic to close the gap. Sean Xerri de Caro netted a grand goal in a bid to lift his Exiles’ spirits midway through the third session before Nikic’s backhand levelled. The battle was brewing as no quarter was given. Marc Grech netted for a Sirens 8-7 advantage before Aurelien Cousin equalised with the northerners hanging onto their slim lead brought forward from match 1 before the start of the last session. Sirens nosed again ahead through Bicari to leave Exiles with a mountain to climb. Sirens’ motiviation, especially that of Sirens custodian Nicholas Grixti could not be matched by the submissive Exiles players who were also thwarted time and again by a solid Sirens’ rearguard. 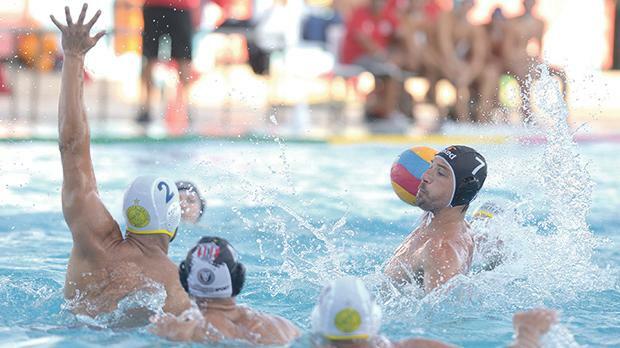 Neptunes continued where they left off last Monday to seal their passage to the semi-final in an emphatic style when they beat Valletta 14-7 to complete a 29-13 aggregate victory. By the end of the day, Neptunes made sure of contesting the play-off semi-final against Sliema this Saturday. Neptunes took over after a first session in which a battling Valletta kept yesterday’s match hanging on an even keel. A five-goal spell by Neptunes in the second session, after Ryan Mock had temporarily equalised, restored some order for Jovan Popovic’s side. With qualification a foregone conclusion, fringe Neptunes players were put into the fray in the last sessions. In the end they emerged comfortable if not emphatic winners with youngsters Jake Muscat and Ken Erdogan putting their names on the scoresheet with Steven Camilleri scoring the majority of Neptunes’ goals when he netted six times. Valletta: R. Sciortino, J. Spiteri Staines, A. Agius 1, M. Mifsud, T. Agius, R. Mock 1, D. Paolella, M. Toth 4, N. Bonello Ghio, C. Zammit 1, N. Farrugia, L. Gialanze, M. Lanzon. Neptunes: A. Borg Cole, N. Lanzon, K. Erdogan 1, G. Pace 2, N. Zammit, S. Camilleri 6, J. Camileri 2, J. Abela 1, M. Zammit 1, J. Muscat 1, M. Azzopardi, J. Parnis. Refs: Stefan Licari, Gianfranco Buonavita. Sirens: N. Grixti, P. Privitera, E. Aquilina, N. Bicari 6, M. Grech 1, I. Riolo, C. Mercieca, J. Scib-erras 1, J. Napier, J. Ciantar, L. Caruana, J. Brownrigg 1, A. Bugeja. Exiles: M. Castillo, M. Fenech 2, A. Bianchi, M. Stellini, T. Sullivan 1, S. Xerri de Caro 1, S. Nikic 2, K. Griscti, N. Paris, A. Cousin 1, B. Lanzon, P. Paris, G. Ciappara. Refs: Alex de Raffaele, Massimo Savarese. 6.15pm Ta’ Xbiex vs Marsaxlokk; 7.30pm Otters vs Marsaskala.